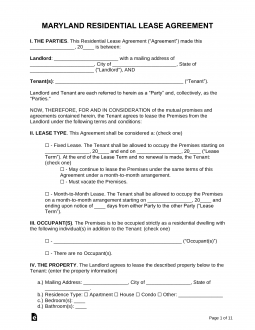 Download Maryland rental agreements that allow a landlord and tenant to come to terms for the use of property for either commercial or residential use. After the lessee approves of the space the parties will begin their negotiations. After agreeing to a monthly amount the landlord will typically request the potential tenant to fill-in an application. If everything checks out then the contract should be drafted and signed. Upon taking occupancy, the tenant is required to complete a move-in checklist provided by the landlord. Rental Application – Form used by a landlord to verify that a potential tenant is able to pay rent on time and that their previous renting history was well received. Association of Realtors – Form designated for the use of Realtors that can be used for a standard residential arrangement. Commercial Lease Agreement – For the purpose of a business use such as storage, retail (store), industrial, office, and any other commercial type. Lease with Option to Purchase (Lease to Own) Agreement – Typical residential contract which also has a provision that includes an option to purchase the property. Month to Month Lease Agreement – Also known as a “tenancy at will”, has a commencement date and must be ended with at least one (1) month’s notice according to § 8-402. Room Rental (Roommate) Agreement – For the individuals in a shared housing arrangement so that they may be able to set parameters around the payment of bills and the usage of common areas. Standard Residential Lease Agreement – To be used for residential tenancies with a start and end date. Sublease Agreement – For a tenant seeking to have someone else pay rent in return for letting them live in a residential space for a part or the remainder of their lease term. Termination Lease Letter – Allows either party to cancel a tenancy at will within the allotted amount of time (30 days) described in § 8-402. Agent/Landlord Identification (§ 8-210) – The landlord and anyone allowed onto the premises must be mentioned. Lead-Based Paint – Only required for residences built prior to 1978 for landlords to inform their tenants of the potential of dangerous lead within the walls and ceiling. Move-in/Move-out Checklist (§  8-203.1) – Within fifteen (15) days of the date of occupancy the tenant must fill-in this form in order to protect their security deposit. Habitation (§ 8–208) – A statement must be included in the Lease Agreement that states the property will be in a condition that permits habitation and list the tenant’s responsibility as to heat, electricity, gas, water, and any necessary repairs. Security Deposit Receipt – According to § 8–203 a receipt must be given to the tenant if a deposit was made. The receipt must also list the tenant’s rights as listed in § 8–203.1. There is no statute that required the landlord to grant notice before going inside the home of a tenant. Although the landlord should be advised that abuse or multiple attempts to access the premises for little to no cause is forbidden. Maximum (§ 8–203) – The landlord may ask for a maximum of two (2) months’ rent from a new tenant. Returning (§ 8–203) – The landlord must return all funds, minus any itemized deductions, to the tenant within forty-five (45) days from the date ending tenancy.